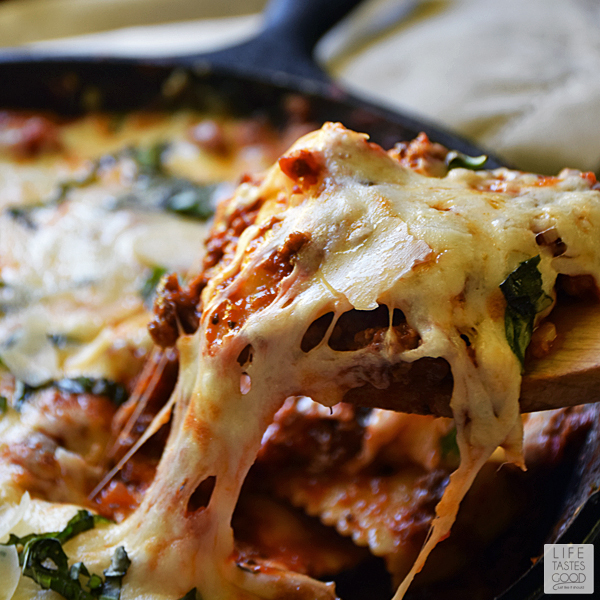 Cheese ravioli swimming in an easy Tuscan beef sauce and smothered in 2 different kinds of cheese, brings a Taste of Italy to the dinner table in under 30 minutes! 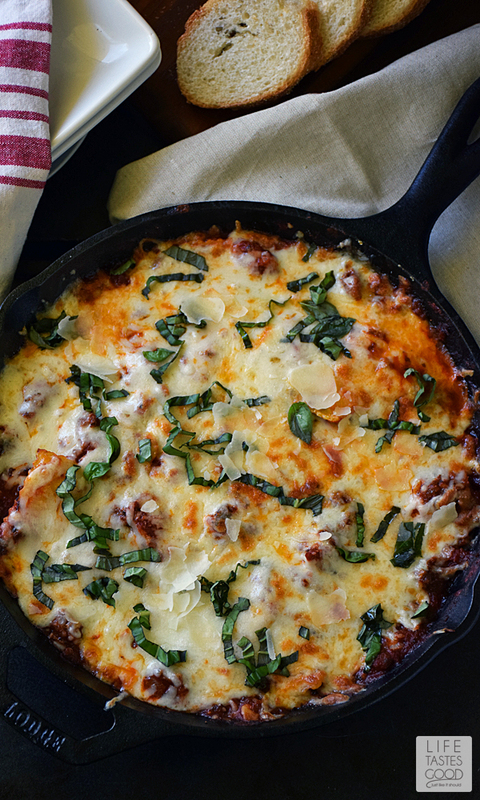 This Cheesy Baked Ravioli in a Skillet is a deliciously easy recipe the whole family will love! While I was visiting my daughter out-of-state, I was at Kroger shopping for dinner when I spotted The Taste of Italy® display. Because my daughter's kitchen doesn't have all the comforts of home, I needed to whip up an easy recipe using some basic kitchen supplies. 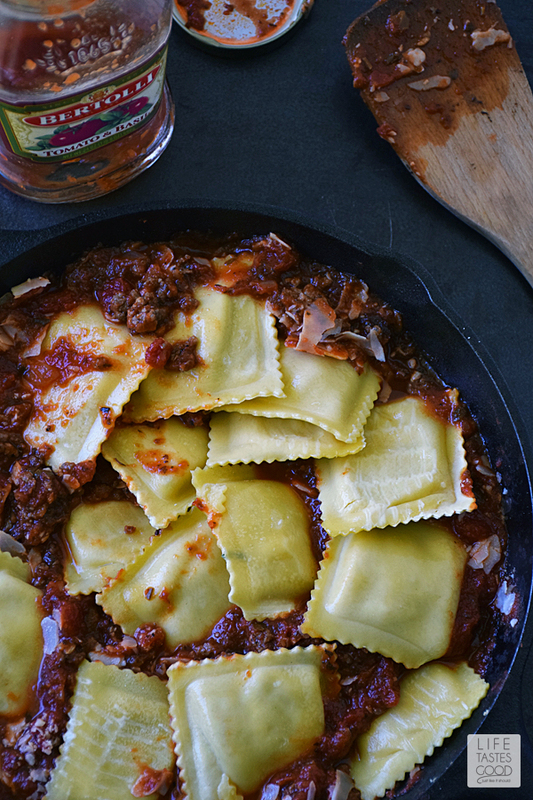 When I saw the Bertolli® Tomato & Basil Sauce I knew it would be perfect for a baked ravioli dish I could whip up in a skillet. 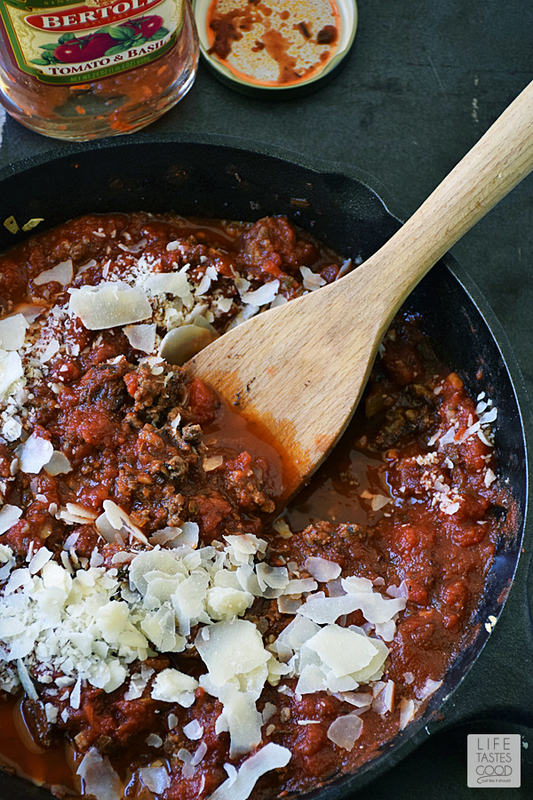 I love cooking everything in one skillet! It's quick and also makes clean-up a breeze! This recipe is on the table in under 30 minutes and the aroma that eminates from the skillet makes you feel like you are dining in a quaint Italian Trattoria. Like most Tuscan cuisine, I kept this recipe simple and economical. 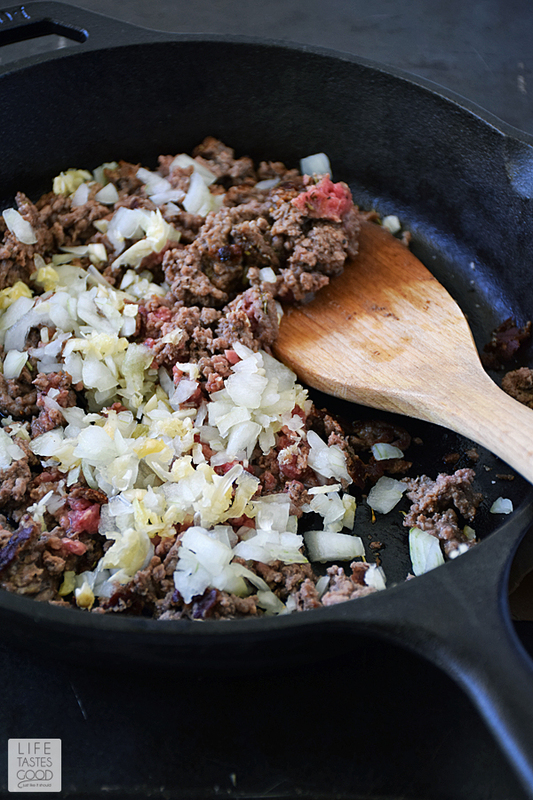 This recipe starts by browning 1/2 pound of lean ground beef in a 10" skillet . 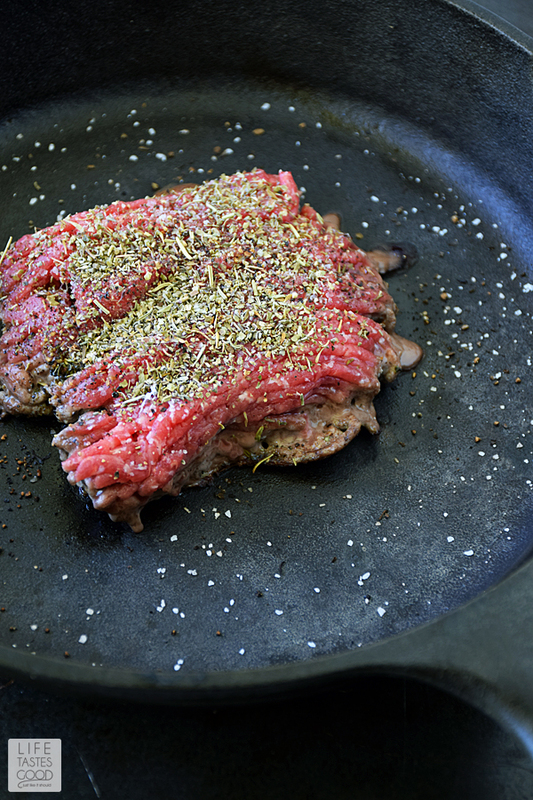 It's a challenge to get a good sear on ground beef, so I place the beef in a hot skillet all in one piece and season it with 1/2 teaspoon of kosher salt, 1/4 teaspoon of freshly ground black pepper, and 1/2 teaspoon of Italian seasoning. Let it sear, undisturbed, for about 5 minutes. This will leave a nice brown crust on one side of the beef, which contributes a great deal of flavor to this dish. When the beef is seared nicely on one side, flip it over and break it up into small pieces and add 1/4 cup diced onion and 1/2 tablespoon of freshly minced garlic. Cook for another 5 minutes or until the beef is cooked through and the onion and garlic are softened. add the ravioli and simmer until heated through, about 5-10 minutes. If you are using frozen ravioli, it will take a little longer. Top with 1 cup of shredded mozzarella cheese (add more to your liking), and place the skillet under the broiler until the cheese is melted and lightly browned. This will only take about a minute. Remember when broiling to leave the oven door ajar and keep a close watch. Once the cheese starts to brown it will burn quickly, and nobody wants burned cheese! 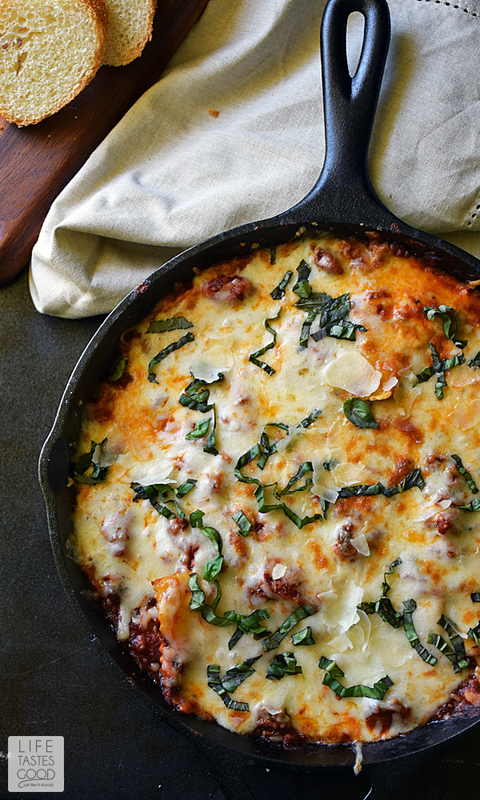 Remove from the oven and garnish with fresh basil and Parmesan cheese. Enjoy with french bread and a garden salad! I like to make this recipe on the weekends and spoon it into individual serving dishes, cover with cheese, broil to melt the cheese and then refrigerate for an even easier dinner during the week! It freezes nicely too! Brown 1/2 pound of lean ground beef in a skillet (I used a 10.25" skillet). It's a challenge to get a good sear on ground beef, so I place the beef in a hot skillet all in one piece (see photo above) and season it with 1/2 teaspoon of kosher salt, 1/4 teaspoon of freshly ground black pepper, and 1/2 teaspoon of Italian seasoning. Let it sear, undisturbed, for about 5 minutes. When the beef is seared nicely on one side, flip it over and break it up into small pieces and add 1/4 cup diced onion and 1/2 tablespoon of freshly minced garlic. Cook for another 5 minutes or until the beef is cooked through and the onion and garlic are softened. Drain fat if needed. 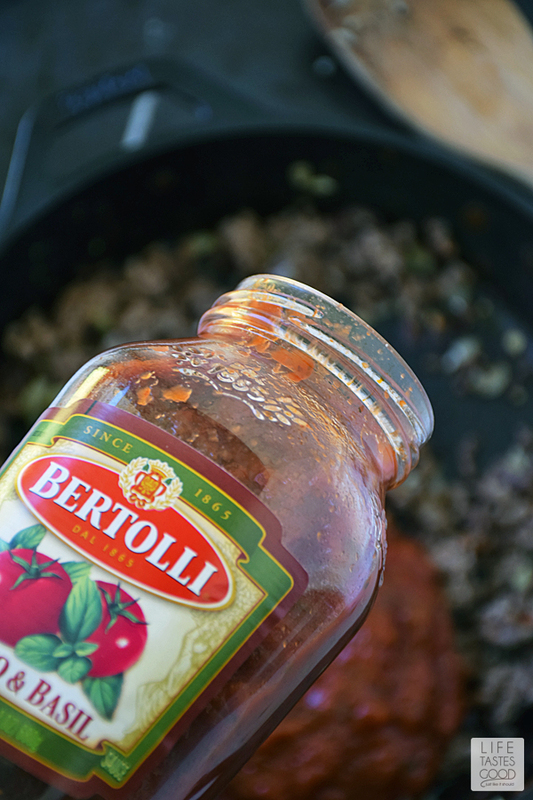 Pour in 1 jar of Bertolli® Tomato & Basil Sauce and stir to combine the sauce and meat. Add 1/4 cup shaved or freshly grated Parmesan cheese and stir to combine. Top with 1 cup of shredded mozzarella cheese (add more to your liking), and place the skillet under the broiler until the cheese is melted and lightly browned. This will only take about a minute. Remember when broiling to leave the oven door ajar and keep a close watch. 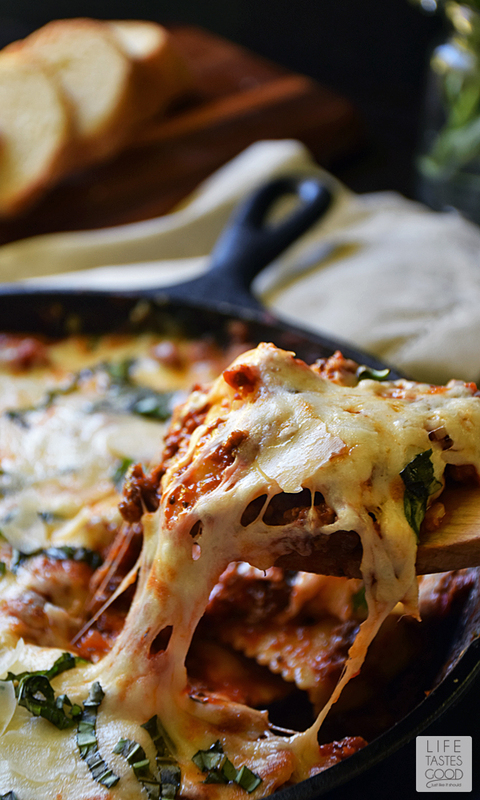 When browned to your liking, remove from the oven and garnish with freshly chopped basil and Parmesan cheese. Enjoy! 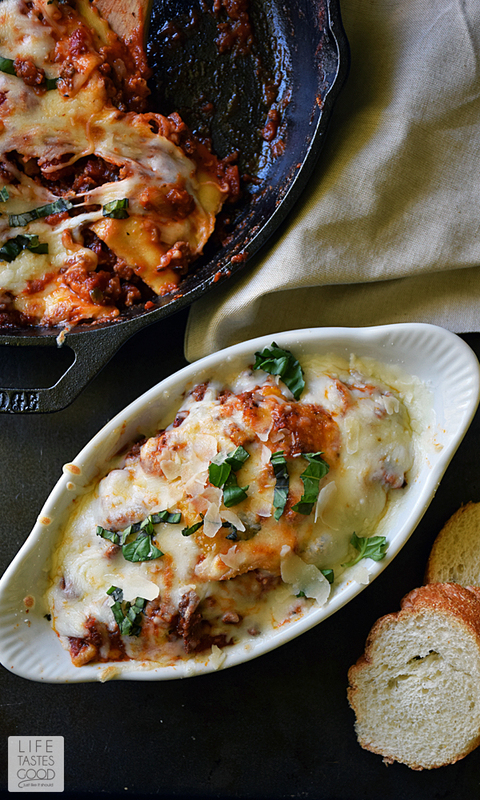 Visit The Taste of Italy® display at Kroger or one of their banner stores to pick up what you need to make my Cheesy Baked Ravioli Skillet or get inspiration to create your own unique Italian dish at home. 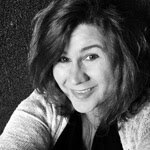 I'd love to see your creations! Tag @lifetastesgoood on Twitter and Instagram. I look forward to sharing your photos!